I was born in Miami, Florida, but my father’s job allowed my family to live in a variety of places in the U.S. and abroad, including Tennessee, Virginia, Ohio, Saudi Arabia, and Israel. Because of living overseas, I was fortunate enough to visit much of Europe, cruise to some Greek Islands, and see fascinating animals on safari in Africa. I received my BA (1990), MA (1992), and PhD (1996) in English language and literature from The Ohio State University. My areas of specialization are nineteenth-century English literature (the Romantic poets), pre-Civil War American literature, critical theory, and teaching with technology. From 1996-2014 I was professor of English and Writing Program Coordinator at the New York Institute of Technology, Old Westbury campus. Currently, I am a full professor of English at Grove City College, where I chair the Writing Program and direct the Writing Center. I also teach a number of writing courses (college composition, writing about literature, and technical writing) and a bunch of literature courses (both face-to-face and online), including civilization and literature, Romantic period literature, Gothic literature, science fiction, and fantasy literature. I’m fascinated with how technology can enhance learning. I have experience teaching in video-conferencing settings, where remote classrooms are linked by video. I also use online learning environments to enhance my traditional classes, incorporating asynchronous discussion boards and synchronous chat sessions to extend the course beyond the physical walls of the traditional classroom. Online education is an exciting opportunity to help people around the country and around the world achieve their personal and professional educational goals. In addition to teaching, I am also an active researcher and scholar. I have published two books: Writing That Makes Sense: Critical Thinking in College Composition, and E-mails to a Young Seeker: Exchanges in Mere Christianity. I lecture and present academic papers on various literary subjects, including Romantic poetry, Gothic novels, and science fiction literature and film (like Alien, The Matrix, and Bladerunner). I have published book chapters, articles, and reviews on 18th-19th century Romantic poetry, Gothic literature, and fantasy literature. I am currently working on a fantasy literature book manuscript as well as various essays dealing with Gothic literature, Romantic literature, and science fiction. 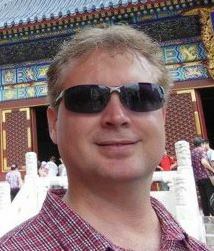 I have taught at NYIT’s Nanjing, China, campus, and I do volunteer work in China during the summers. I enjoy traveling, biking, and playing guitar, and I am active in my local church. I try to keep fit through martial arts training and teaching.